The B+S Standard and Combination Commercial Stoves are available in two ranges - VERRO and B+S Black. Both are manufactured on a solid stainless steel frame using AISI 304 grade stainless steel. Each burner in both ranges is fitted with a multi-setting gas valve allowing for greater regulation of the flame. Maintenance is made easy with access to all components through the front of the unit. The VERRO Boiling Top comes with a 24 month warranty and the B+S Black Stoves (Boiling Tops) comes with an 18 month warranty. The B+S Black series standard and combination Boiling Tops are manufactured on a solid stainless steel frame, which are built to last. 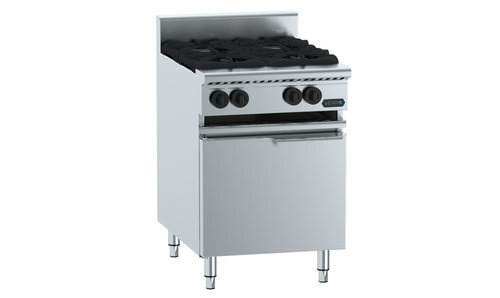 This unit also has an open stand and under shelf, which is ideal for storing cooking utensils. The VERRO premium fusion series boiling tops deliver the best in quality, performance and flexibility. All units are constructed from AISI 304 grade stainless steel and feature a heavy duty European made vitreous enameled trivet with extended fingers that allow for smaller pots as well as large to be used in operation.